Peritoneal Port Insertion procedure is a minimally-invasive procedure where a port is inserted under the skin, and a catheter connected from the port is suspended in the peritoneum. The Peritoneal Port Insertion procedure involves the peritoneum (in the abdominal cavity). Why is the Peritoneal Port Insertion radiology procedure Performed? There have been no recent advances with respect to the Peritoneal Port Insertion procedure. What is the Cost of performing the Peritoneal Port Insertion radiology procedure? The cost of Peritoneal Port Insertion procedure depends on a variety of factors, such as the type of your health insurance, annual deductibles, co-pay requirements, out-of-network and in-network of your healthcare providers and healthcare facilities. How does the Peritoneal Port Insertion radiology procedure work? How is the Peritoneal Port Insertion radiology procedure Performed? The Peritoneal Port Insertion procedure is performed as an outpatient procedure, at a hospital. An interventional radiologist or a general surgeon performs the Peritoneal Port Insertion procedure. The Peritoneal Port Insertion procedure usually takes about two hours. It may take longer depending upon the overall health status of the individual undergoing the procedure. After a peritoneal port is inserted, radiological studies are performed to confirm that the port is placed in the correct position. The radiological studies are then interpreted by an interventional radiologist. A physician will request your consent for Peritoneal Port Insertion procedure using an Informed Consent Form. What are the Limitations of the Peritoneal Port Insertion radiology procedure? The peritoneal ports can be punctured for about a 1000 times. After this, a new peritoneal port must be put in place, which requires repeating the whole procedure. 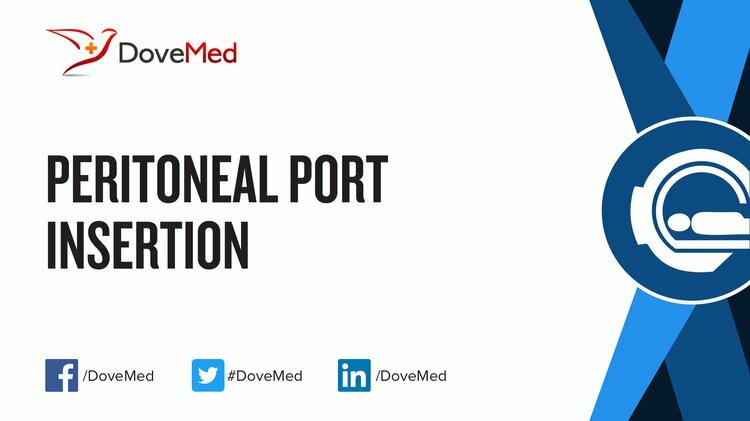 What is a Peritoneal Port Insertion procedure? Are there any lifestyle restrictions or modifications required after the procedure is performed? What is to be expected during the Peritoneal Port Insertion radiology procedure? Moderate sedation or general anesthesia is used during the Peritoneal Port Insertion procedure. The Peritoneal Port Insertion procedure is a minimally-invasive procedure; thus, the blood loss involved during the procedure is minimal. What are the possible Risks and Complications during the Peritoneal Port Insertion radiology procedure? A Peritoneal Port Insertion procedure involves skin incisions, and thus there is a chance of developing infection at the area of port insertion. What Post-Operative Care is needed at the Healthcare Facility after the Peritoneal Port Insertion radiology procedure? What is to be expected after the Peritoneal Port Insertion radiology procedure? What Post-Operative Care is needed at Home after the Peritoneal Port Insertion radiology procedure? Patients may resume light exercises and normal shower after the complete healing of the port insertion, which may take a week or two. The Peritoneal Port Insertion procedure does not involve the removal of any body tissue. Who will you receive a Bill from, after the Peritoneal Port Insertion radiology procedure? The patient is advised to inquire and confirm the type of billing, before Peritoneal Port Insertion procedure is performed.